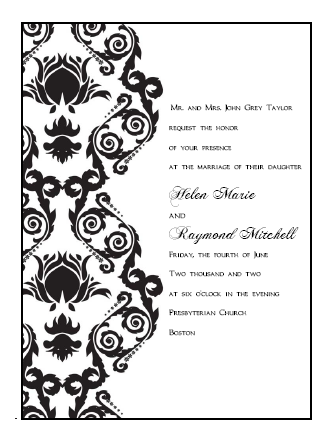 Damask pattern printable wedding invitations templates. Print and make your own damask print wedding invitations using our wedding invitation and stationery kits. Our kits include everything from Save the Dates and response cards to favor tags and wine labels. Purchase a small or large kit, or shop ala carte. We have many colors to choose from or contact us to purchase a custom colored kit. All invitations are payable through Paypal. Download instantly! Our printable wedding invitations kits are provided in the form of an electronic PDF file. You can download a copy of Adobe Reader absolutely free if you do not already have a PDF reader. 1. Download our printable invitations PDF file. 2. 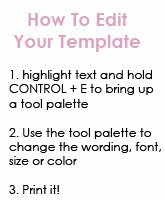 Change the text to match your wedding invitation wording. You can even change the fonts, size, or color of the text! 3. Print the invitations on 8 1/2" by 11" paper of your choice. Cardstock works best, and use the highest quality print settings for best results. 4. Cut the invitations to size using a personal paper cutter or bring them to a local copy or print shop for paper cutting services. 5. (optional) Jazz them up by adding a colored backing, or ribbon/belly band, or even attach them to pocketfold invitation paper! Looking for a specific design or theme? We also do custom printable wedding invitations.